Mark ‘Sunday May 17′ on your calendar. A candlelight vigil will be held in 115 countries lead by varied coalitions of some 1,200 community organizations. The International AIDS candlelight vigil is a grassroots mobilization initiative against AIDS organized by the Global Health Council. With 33 million people living with HIV/AIDS today, this event is a global solidarity effort to fight AIDS. 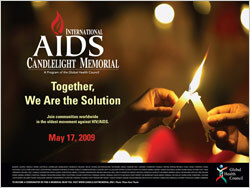 The theme for the 2009 International AIDS Candlelight Memorial Day is “Together, We are the Solution”. HIV/AIDS remains one of the world greatest challenges. It has caused death to millions and greatly harmed economies. As we declare solidarity in our response to the AIDS crisis, world leaders must be reminded of their commitment to fully fund projects combating HIV/AIDS. In recently published information from the World Bank, anti-retroviral treatment is under threat because of the global economic downturn. Many donor governments are cutting back on domestic and foreign funding. To locate your event for May 17, contact your local AIDS groups. Coordinators for candlelight vigils are being encouraged to use the international theme in conjunction with local themes.